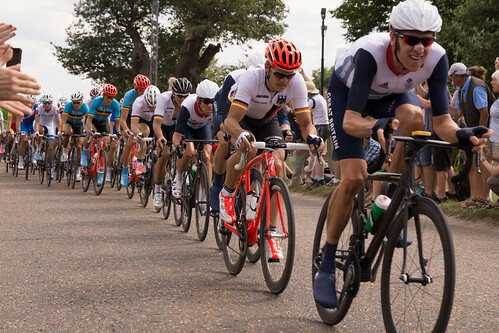 Up early today for the first Olympic action with the Men’s Road Race departing from Central London at 10am. 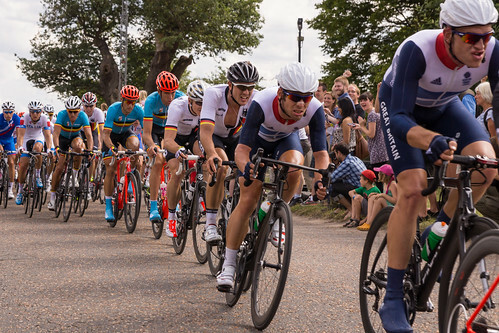 I got to Richmond Park an hour ahead of that and roughly twenty minutes’ later, the peleton arrived. They weren’t really racing at that point, and looked like a big colourful cycling club out for a Sunday run in the park. 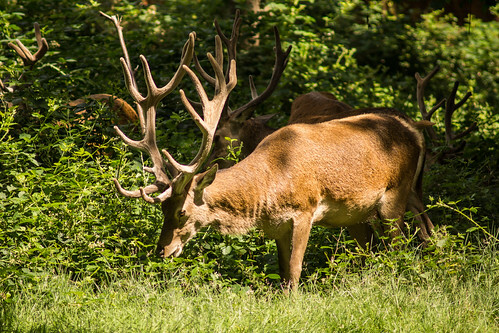 A little later, after a refreshing beverage at a nearby hostelry, we returned, via the inevitable deer, to take up different positions to see the return of the racers. By this point there was a considerably dangerous group who’d gained a minute of the peleton. Ordinarily that would be a relatively straightforward gap to breach, but essentially the GB riders were being left on their own to do the work. Even the German team who wanted to put Greipl in the bunch sprint weren’t really going for it. As a result, the breakaway group of roughly thirty were sharing the pain more successfully and maintained their gap. There was some drama when around 200m from us (and out of sight), Fabian Cancellera crashed on the corner at Richmond Gate. In the meantime, the GB team gave everything they could. At the point they passed us, Brad was giving it full gas on the front with Chris Froome and David Millar having been dropped having done all they could. But it was not to be, and Alexandr Vinoukorov won fairly comfortably against Colombian Sky rider Rigoberto Uran. A little disappointing given his fairly unapologetic background in doping. Unlike David Millar, he has not come back full of remorse. Nonetheless, it was a fun day in lovely weather in the park. More photos are on Flickr here. A side note is that I understand that there were problems with the TV coverage. I was mostly reliant on radio and they too had very little timing information. Unlike, say, the Tour de France, where timing information is excellent and ever present, there was a real paucity in this race. From what I’ve read subsequently, it appears that for whatever reason, the GPS equipment wasn’t working, hence the lack of information. Let’s hope that they fix it for the Women’s Road Race on Sunday. 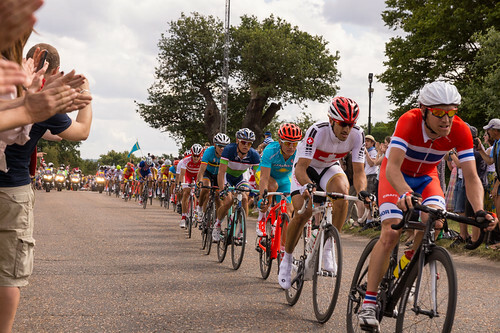 The race coverage is provided by OBS – Olympic Broadcast Services. They in turn subcontract it to various countries. I assume that they give cycling to the French, but I really don’t know. What’s not the OBS’s fault was the terrible coverage from the BBC reporter on the Ten O’Clock News that I caught when I got back home. They included a bit of an interview with an upset Mark Cavendish was rude to the reporter, asking him if he understood cycling. Unfortunately, from his report, it was clear that he didn’t. I know it’s not easy to explain both the tactics and tell viewers what happened in a sport which they might not be familiar with. But his report was utterly misleading. And it was also disappointing that he repeated that all too familiar mantra that we “expect” to win medals. Well guess what, it’s called “sport”. And that means that we don’t know in advance what the outcome of any given fixture will be. If we did, then it wouldn’t actually be any fun watching the action. Our athletes are undoubtedly under tremendous pressure. But that’s doesn’t mean that we should report lack of medal success as some kind of dismal failure. 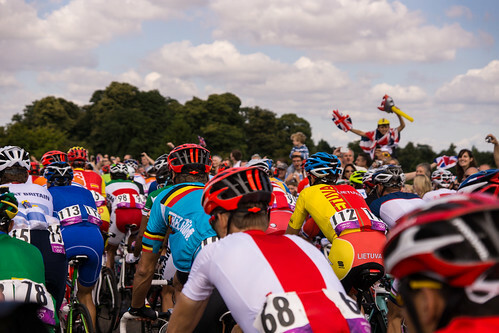 While the nation might have thought that it was a given that Cav would win today, unlike a stage race, a single day’s racing introduces many uncertainties. And reporters like everyone else need to understand that.